The heart and focus of my art is to capture the essence of beautiful places and things and to express them in a beautiful, elegant way. Whether painting in watercolor or oil, my emphasis is the same: to create a soft, impressionistic feeling that draws viewers in. I select subjects—classic still life, elegant flowers and romantic landscapes-- that excite and inspire me to create a work of art--an illusion of light and depth, done in luminous, rich color with expressive painterly brushwork. I often include man-made objects or architectural elements as an intentional contrast to the flow and rhythm of the more predominant softer, natural shapes. For me, the process of creating a painting is magical. I like to work with a direct alla prima approach in response to my observations and impressions of the subject and the setting. But, as an artist, knowing how to place the right shapes, colors, values and edges of paint allows me to go further, to create an illusion of these real three-dimensional objects or scenes on a two-dimensional surface, and in doing so, evoke in the viewer a mood, an emotion or a sense of place or time, and, most of all, an awareness and appreciation of beauty. My goal is to create art that instills joy and uplifts spirits through the timeless beauty of art and nature. Pat Fiorello is a professional artist and popular art instructor known for her impressionistic landscapes and elegant floral paintings in both oil and watercolor. Inspired to make the expression of beauty a higher priority in her life, in 2002, she left a successful 20-year career as a Marketing Vice President with major corporations including The Coca-Cola Company, and made a dramatic life change to become a full-time artist. “I was driven by a desire to create beautiful things,” she says. “Through my paintings, I hope to inspire in people a deeper awareness and appreciation of the beauty around us. Pat’s Italian family name “Fiorello” means “one who lives near a wall of flowers,” so she seemed destined to have a passion for the romantic landscapes and exquisite flowers that she captures in her paintings. Based in Atlanta, she teaches in the United States, and has led over 15 painting workshops in Italy, France and Spain. In 2015, Pat taught at Monet’s Garden in Giverny France. While there she won First Prize in the annual plein air painting competition and was invited back by the Mayor to exhibit her work at the “Laureate de la Fete de la Peinture” exposition in France. Pat has studied with noted artists including mentor Marilyn Simandle, Robert Johnson, Ovanes Berberian, Betty Carr, Mel Stabin and Charles Reid. She is a member of Oil Painters of America and American Impressionist Society and has served as Chairman of the Atlanta Artists Center. 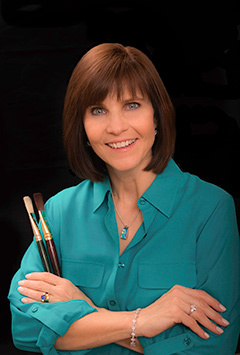 A Signature Member of the Georgia Watercolor Society, she has served as President of the organization. 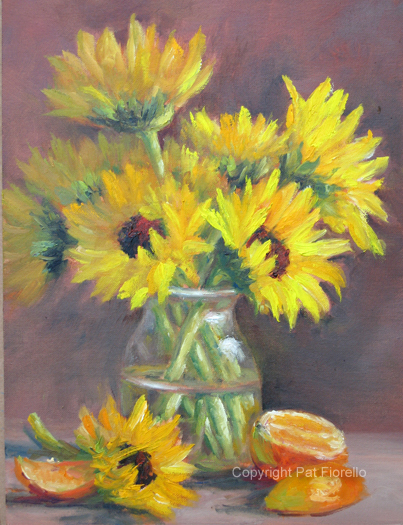 Pat’s paintings have been in over 75-juried shows and more than 20 one-woman exhibits, including being the featured artist at the State Botanical Garden of Georgia and Callaway Gardens. Her work has appeared in the book Splash 11, The Best of Watercolor, published by North Light Books. She is author of the book, “Bella Italia, Italy Through the Eyes of an Artist” published in 2013. Pat’s paintings hang in private collections across the country and internationally. Frameworks Gallery in Marietta, GA and Burton Gallery in Clarkesville, GA represent her artwork.